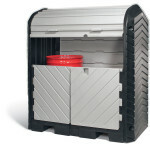 PIG Roll Top Pallets provide easy drum storage without removing pumps and funnels. 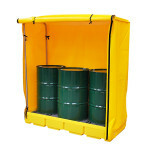 These unique liquid containment solutions are weather-tight so they can be used for drum storage indoors or outdoors. PIG Roll Top Hardcover Pallets are strong enough to be forklifted with fully loaded drums in place. 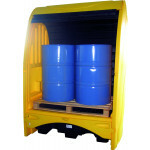 For larger storage containment needs, check out our PIG IBC Roll Tops, built for heavy loads and easy dispensing. Our Roll Top Hardcovers are built for convenience and compliance while ensuring drums are safe and secure. 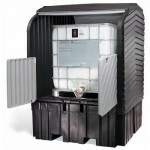 For an economical choice for outdoor containment, we offer our PIG Essentials line of Roll Top Hardcovers.